THE RECOMMENDATION: I recently re-watched Synedoche, New York which was Charlie Kaufman’s directorial debut and while I wasn’t as blown away as I was the first time I saw it, what struck me most was Kaufman’s distinct and signature style. He is incredibly original, but he’s original in some of the most bizarre ways and to some is probably a bit of an acquired taste. Anomalisa follows in this same vein of bizarre originality that at times is genius, but at others is a bit of a puzzle, more so than Kaufman’s previous works. Anomalisa plays kind of like a stand-up routine in that it takes mundane, run-of-the-mill experiences and paints them in a new life. Comedians seemingly favorite topics of airplanes, hotels, and more face similar scrutiny in Anomalisa only without the usual accompaniment of wall-to-wall laughs. While not framed as humor or comedy, what Kaufman does here is nevertheless interesting and worthy of its own merits. 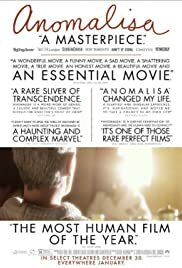 These examinations of human life, and in particular, the experiences of Michael Stone’s (David Thewlis) monotonous life, are what makes Anomalisa so interesting and worth watching. However, like Stone’s boring dead-end life, the film too faces similar problems at keeping you attentive throughout. I found myself drifting off and losing interesting repeatedly throughout the film. Part of it might be due to the story being too weird (even for a Charlie Kaufman film), but I think the more likely explanation is it felt like a play. That would make sense since Anomalisa was adapted from the play of the same name which Kaufman wrote in 2005 (under the pen name Francis Fregoli), but I’ve previously come down against films adapted from plays such as Glengarry Glen Ross and The Big Kahuna. Unlike Birdman, which I would cite as a well-done example (even though it’s not actually adapted from a play, but I still see similarities between the two), Anomalisa doesn’t do a great job with the characters and turning the film into a performance piece. An interesting film to watch, and certainly noteworthy for being the first R-rated film to be nominated for the Academy Award for Best Animated Feature, but of that category, Inside Out is hands-down my favorite animated film of 2015.